The White Diver is an ideal attractor. It is incredibly life-like and best results are often when it is fished near the bottom, over weed beds. The white colour is easily seen in coloured water stimulating aggressive takes. It is a very productive fly during March and April. Use a short jerky retrieve to simulate fry. Often a trout will follow your fly all the way to the rod tip and then either turn away at the last second, or take the lure at the very last moment. Great fun and very exciting. 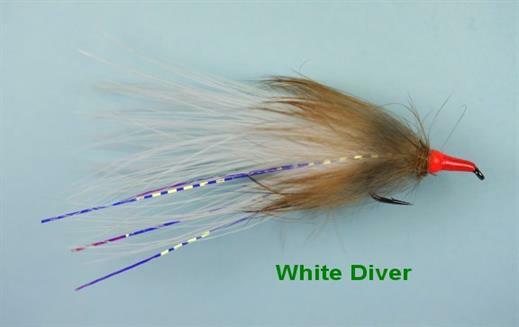 Currently there are no comments about the White Diver fly pattern from other fly fishermen yet.